The Wake County Board of Alcoholic Control Law Enforcement Division consists of 6 full-time sworn officers who enforce the Alcoholic Beverage Control laws of North Carolina. Under the authority of N.C. General Statue 18B-501, Wake County ABC Officers primarily investigate and enforce the ABC and Drug related laws of our State. In addition, local ABC Officers also inspect and investigate the operation of ABC licensed outlets and forward any violations of the North Carolina Administrative Code to the North Carolina ABC Commission. Wake County ABC Officers are dedicated in enforcing the underage drinking laws and reducing the number of underage violations in our community. Enforcement efforts are focused on the underage violator, persons providing/giving alcohol to underage, alcohol purchases made by using fraudulent identifications, and the retail outlets selling alcohol to underage customers. Through our efforts of conducting underage alcohol compliance checks, we have locally documented an approximate 40% reduction in the sale to underage over the last several years. Alcohol sales education efforts by our agency have also greatly assisted in that reduction. Drug enforcement efforts by our agency are focused on those offenders and areas within our community where the greatest need exist. A special emphasis is placed where drug violations are occurring on or related to alcohol permitted premises. 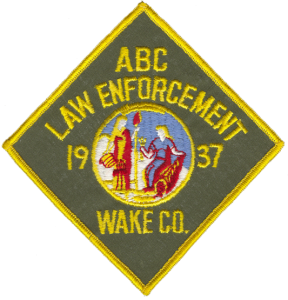 Wake County ABC Law Enforcement prides itself in the relationship maintained with other law enforcement agencies. Our efforts are at times combined with the resources of other agencies on the local, state, and federal level to provide the best service available for our community.